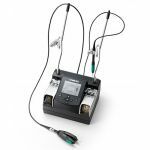 JBC Tools NANO Soldering and SMD Station Line is the best solution for soldering very small-sized components requiring the highest precision such as chips 0402, 0201, 01005, etc.. The NASE-1B or NANE-1B tools for this station are the Nano Soldering Iron NT205-A and Nano Tweezers NP105-A, allow you to work at the highest precison because they are the lightest, tiniest, and most ergonomic on the market. The control unit is fully compatible with either tweezers or irons. Choose a JBC Tools NANO Soldering and SMD Station Today.